Today we learned all about ice cream! Who doesn't love ice cream?! We sure do. I love when I can make something as fun as eating and making ice cream a complete lesson for school. This is the kind of schoolwork no one ever complains about! It was the perfect mini unit for some summer fun. My boys remembered me telling them on Thursday when we did groceries that I bought 1/2 and 1/2 to make our own ice cream and they asked if we could do that today. I had found (on Pinterest of course!) instructions on how to make your own ice cream in plastic baggies. They could not wait to try it. Wanting to go a bit further into the subject though I googled "the science behind making ice cream" and found a great article at About.com on the chemistry behind ice cream making. We made a quick trip into the library and found a few books on making ice cream. We read a books and talked about the article I had found. Then we made ice cream for dinner! 1. 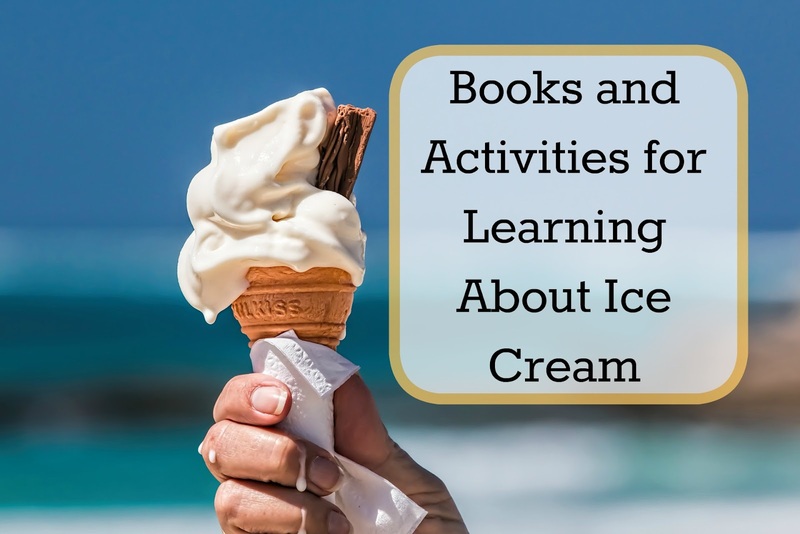 From Cow to Ice Cream-- This non fiction book is easy to read with just a sentence or two on each page with large colorful photographs. 2. Ice Cream: The Full Scoop-- We love all of Gail Gibbons book and this one was filled with all sorts of wonderful facts about ice cream. 3. Milk to Ice Cream- Another easy to read non- fiction book about making ice cream. 4. Should I Share My Ice Cream?-- We love any excuse to read an elephant and piggie book together! 5. The Sundae Scoop-- A great book that incorporates math and all the combinations that can be made using just 6 ingredients. 6. The Ice Cream King-- A wonderful book that teaches all about the importance of sharing. 7. From Milk to Ice Cream-- Another great non- fiction book that takes you through the process from cow to cone! 8. Splat The Cat; I Scream for Ice Cream -- We love Splat the Cat books! They're always so fun and cute. 9. Ice Cream Cones for Sale- This book takes readers through the great debate over who invented the ice cream cone. A fun look at history. 10. Ice Cream-- A fun look at important moments in ice cream history. I'm not sure how much the boys actually understood about the science behind making ice cream, but I'm sure this is one science experiment we'll get to do over and over and over each year! Put the first three ingredients in a small quart size Ziploc bag and make sure it's zipped tight. Then take a gallon zipper bag and fill 1/2 full with ice and 1/2 cup coarse or table salt (coarse works better but table salt works too). Put the qt. size bag in the gallon bag, zip shut and shake for about 5 min. It will get very cold very fast and you want to either use oven mitts, towels, or a few sheets of newspaper to roll around the bag allowing you to hold it without getting freezer burn. After 5 minutes, open it up and check to make sure the quart size bag feels like it has ice cream inside; if not shake a bit more (it really shouldn't take much more than 10 min though). Once you have ice cream rinse the salt off the quart size bag, open it and eat it! We added sprinkles of chopped heath bar &/or Oreo cookie crumbs to make it extra yummy! Hold a blind taste test and see if they can identify various flavors of ice cream without looking. Write a short story about their favorite ice cream flavor or have the kids write up a recipe for making a banana split. Make Ice Cream play dough; combine 1 can of pre-made frosting with 1 cup of cornstarch. It looks just like ice cream!